Tempted to run Windows 10? Low on disk space? Have a NAS that supports iSCSI? Thinking what I’m thinking? You can change the disk bus under the "Advanced options". The remaining defaults are fine. These worked for me, some of these may be sub-optimal though. I used a SCSI CD-ROM drive for the Windows 10 install iso, because for some stranage reason KVM didn’t seem to like launching with multiple IDE devices. I would’ve liked to use the UEFI firmware rather than SeaBIOS, but by the time I thought about this it was too late to change that setting, so I’ll leave that for another time. You’ll need the Fedora project’s Windows VirtIO drivers from this link, attach them to the IDE CD-ROM drive. 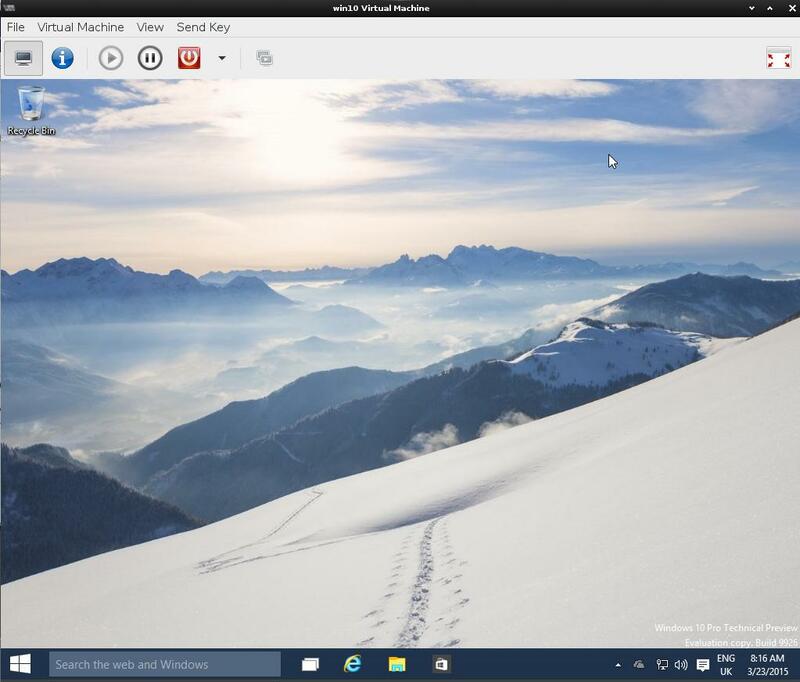 You can get the Windows 10 Tech Preview iso from here. During the installation, you’ll get some popups telling you that Windows can’t find the right drivers to access necessary hardware. First, you’ll need to use the “RedHat VirtIO SCSI pass-through controller” driver (to access the SCSI CD-ROM apparently), then later on the “RedHat VirtIO SCSI controller” one to access the disk. VirtIO driver selection during Windows 10 Tech Preview installation. One strange issue that I noticed was that after a reboot, booting from the HDD would fail; the VM would just go into a reboot loop. To work around this, I just used the “Force Off” power button option, and then started the VM again using the Play button – then the VM would boot again just fine. Oh, did I mention this is very slow? It’s probably at least partially my NAS’ fault, which only seems to do ~30MB/s read/write speeds over the network (RAID 1 – it’s mostly there for my critical data after all). But hey, it works. I’ll use it to debug some Windows client / Linux server stuff; it should be quicker than updating servers and rebooting to switch OSes. Hey, thanks for this…was struggling with KMODE_xxx error, the switch to using virtio for disk and rom seemed to solve the problem. Although I’ve only been able to complete the install using seabios…ovmf I am struggling to get to see the iso boot media! Did you ever make the switch to ovmf/efi? Just a note that the q35 chipset change is superfluous, ive just done both q35 and i440fx with no issues. No, I haven’t switched to ovmf yet, sorry. I updated the post to mention that the i440fx chipset also works, thank you for that nugget of information. So I got this working using the latest OVFM builds from here (https://www.kraxel.org/repos/jenkins/edk2/). I try to install Windows 10 OS on my Ubuntu server (with qemu + Webvirtmgr) but I had a issue. “Your PC ran into a problem and needs to restart. We’ll restart for you. Could you please send me your xml file so I can check it? Is there anything I need to change with the way I start/execute kvm for installation? The above script works for WinXP and Win7 though. Did you resolve this problem? If so, what did you do? Also, has anyone had trouble installing Win10 on real hardware and then AFTER installation switching to a virtual disk? In my configuration, I installed Win10 onto a physical partition and then I tried booting Win10 using the RedHat SCSI drivers with the hypervisor pointing to my previously installed Win10 image. This process works under win7. With win10, I get all the way through the real-mode boot process and then see a BSOD with an 0x7B error, “Inaccessible Boot Device”. Is it possible that the RedHat drivers only allow one to boot when Win10 is installed or upgraded using those drivers originally? Has anyone had trouble installing Win10 on real hardware and then AFTER installation switching to a virtual disk? In my configuration, I installed Win10 onto a physical partition and then I tried booting Win10 using the RedHat SCSI drivers with the hypervisor pointing to my previously installed Win10 image. This process works under win7. With win10, I get all the way through the real-mode boot process and then see a BSOD with an 0x7B error, “Inaccessible Boot Device”. Yeah, I think I had the same problem. While I don’t remember the exact error message, I couldn’t make booting a bare-metal-first installation work in a VM using the RedHat-signed drivers. I even tried to install the drivers manually (right-click .inf file, “install”), but that didn’t fix the problem. I figured that maybe Windows needs to actually know the device -> driver mapping for non-default drivers, so my workaround was to install Windows in the VM. Thank you for your reply. This was extremely helpful. I’m sorely tempted to doctor the Hypervisor to see if Win10 actually goes searching for the PCI device with which it was originally installed, just to see if our intuition is correct. That runs fine as a standalone VM. firing up the Windows VM instances vs the standalone method I am doing now. Did you ever manage to run Windows 10 in Openstack? Oops, indeed. Thanks for pointing that out!